Winchester Mystery House is legendary now. 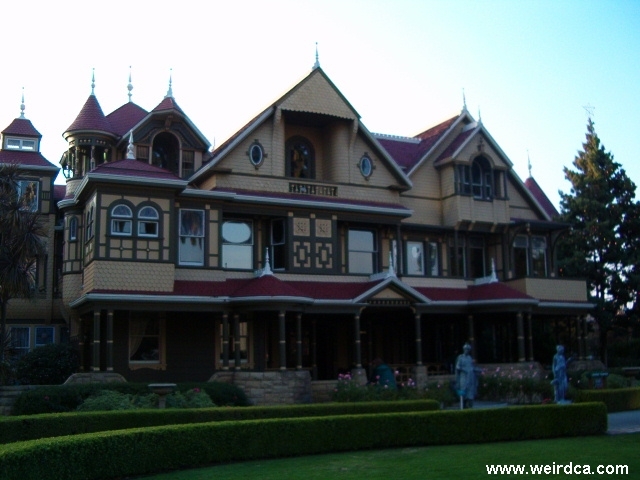 The construction of Sarah Winchester, the house was kept in perpetual construction while she was alive. Mrs. Winchester believed that as long as construction kept up night and day, then the spirits of the people killed by the Winchester rifle would be appeased. As a result, the mansion is a convoluted maze of hallways and rooms with some staircases and doors leading no where. There is even a door that opens up to thin air several feet off the ground. Her sense of paranoia was further enhanced as a result of the deaths of her husband and infant daughter. Additionally Sarah Winchester was obsessed with the number 13. A variety of items are grouped in sets of 13 or appear only in numbers of 13, such as 13 panes of glass or 13 palm trees or 13 bathrooms. Also a lot of the columns in the house, railings, etc, are hung upside down. Because of Sarah's small size, several stair cases are built with very tiny steps, called risers by the tour guides. One cabinet in the kitchen opens up into an entire other section of the mansion with multiple rooms. Mrs. Winchester also had a séance room which she went into every night. During her sessions in the séance room, she would come up with new plans for the construction of the house. When Mrs. Winchester died, construction stopped immediately right where it was leaving unfinished rooms, incomplete walls, etc. Now spirits are rumored to wander the twisted maze of passageways that are the mansion. Not only Sarah Winchester, but other spectral spirits inhabit the enormous house. Entry is a work in progress. i've been there last year for a tour (it was several hours long), and we went through all the places, including her bedroom, unfinished rooms, and the stair case leading to nowhere (just to name a few). at the end of the tour, i asked the guide if she ever seen any ghosts. she simply just said no anyways the place is pretty cool, and you should go check it out. The number 13. A combination of 7 + 6 = 13 Number 7: A holy number. The heavenly number, above all earth. Number 6: A fallen Angel number. Satanic powers are suppose to possess the number 6 or 666. Both numbers togeather are supposedly badluck, according to mortals. The number 13 is mystical.